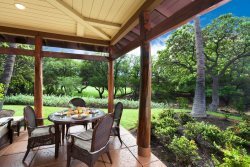 See what people are saying about ResorticaHawaii.com - Kohala Coasts' premier source for luxury Waikoloa Hawaii vacation rentals, Mauna Lani and surrounding areas. Very friendly and helpful people. From the first call to ResorticaHawaii which was answered on the first ring by a very friendly person to our arrival and stay I can't say enough how attentive the people were to our needs. We were pleasantly surprised at how clean, quiet and tastefully decorated our condo was. Everything was so clearly marked like each of the switches told what they turned on, the washer and dish washer had a label telling where the soap was located. The umbrella and chairs for the beach were in excellent shape and greatly appreciated. There was also a big cooler which came in handy for the beach and there were plenty of hangers in the closet. The grounds were clean as was the area to dispose of garbage. Nice place, great location and had a fun time; thanks. Fantastic relaxing stay! Enjoyed the lovely pool very close to the condo. Beautiful and quiet area with mountain and golf views. Lovely lanai with great furniture. Condo was well stocked with beach supplies and kitchen supplies. I emailed two or three times regarding the unit before we actually made the reservations and Kim Horton responded very quickly. She put my mind at ease about renting this unit which was new to the rentals and all the information regarding the unit was not yet posted. The property is located in the most convenient area. It is walking distance to a beautiful open air shopping mall and one of the best grocery stores fully stocked with gourmet foods and the convenience of an ABC store as well. The property grounds are meticulously maintained and the staff of Evan, Lyn and others were so friendly, nice and accommodating. We were extremely impressed with how neat and clean the grounds were and loved our unit, if we were to come back to the Big Island we would only stay here. Hale Pa'ani was like experiencing heaven on earth. The view from the home is magnificent and exceeded our expectations. The location on the island was ideal as the weather there was typically sunny rather than rainy. We loved sitting on the lanai to watch the ocean, mountains, and the playful games of colorful birds nearby. The home was incredibly spacious and had everything we could need, including snorkel gear, boogie boards, and a cooler to bring on our beach excursions. The beds were very comfortable and the kitchen had everything we needed for preparing our meals. We are counting down the days until we can go back! The condo was beautiful and extremely well stocked, better than we expected. We loved it so much we even looked at buying our own, but think it would just make sense to use this one for the future. The bedding was extremely comfortable and when the AC was on it kept the house very cool and comfortable. All the appliances were great quality which was nice when we cooked at home. The Hilton Pool Pass was a huge additional benefit of this condo. The Hilton is a 15 minute walk or a 3 minute drive and it is a beautiful resort with tons of activities, this makes your condo very highly desirable! A few things we think could be better: 1. Be more transparent about the AC up front. We were uncomfortable the first week of our visit because we could only lower the AC to 74 degrees, specifically at night. The note says it was for the environment to keep it only at 74 which should be noted when doing the rental. 2. Making your properties more family friendly would benefit you. Have a high chair and pack n play available at your office, which is close by, so that when families visit you can give that out. Having to rent them was extremely expensive and other companies offer this complementary. The initial investment would be minimal and it would generate more interest from families. 3. Have more plugs/power supplies available in the bedrooms. We had to disconnect the alarm clock and light to get all our devices plugged in by the bed 4. Not really your fault but the pool was a bit on the cold side, unfortunately. ******MANAGEMENT RESPONSE****Thank you for your review! We are so glad that you enjoyed your stay and would be happy to welcome you again! We will definitely pass on your comments about the plugs to our management. In regards to the A/C we do disclose in our Terms and Conditions that are disclosed in the booking process that the A/C is controlled and to reach out to us about possibility of A/C override. For the Baby equipment, we refer guest to a baby equipment rental company for liability reasons to ensure safe/reliable items. The rental companies are able to ensure safe/up to date baby items. When we did have issues most of our communication was on line and issues resolved quickly. Only one issue was never addressed while we were on the premises. Loved it, everyone had a great time. The maintence man and his wife who responded to our needs were very friendly and helpful. Anne Marie was very courteous and a pleasure to work with. I would totally recommend your company to other friends coming to Hawaii. We had a great stay in the condo and look forward to coming back another time, Being close to the pool was great for our son and it was also nice being walking distance to the beach.